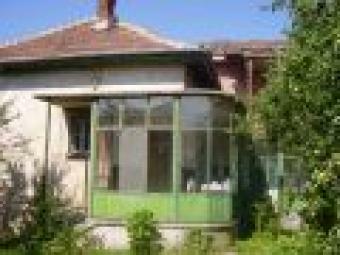 This large c. 170 sqm house is in the village of Chomakovtsi only 3 m from the tidy municipal town of Cherven Bryag. The village is a very quiet place with many fishing spots - the main reason many other English families have purchased properties here. The house is well constructed and brick built. It is uniquely designed and thus very difficult to describe but, put it this way - you will definitely have something no one else has! The house has a large glazed veranda as you can see in the photos. From here you have access to both parts of the property. To the left a door leads into the main part with a large hallway, some 3m x 3m in size with three rooms off it. Room one is 5m x 5m in size, has two windows and wooden floor boards. Room two is 5m x 6m, again with wooden floor boards and two windows. The third room is a box bedroom, 3m x 3m with one window. There is an additional strorage room off the hallway, ideal for a shower and toilet. The water is connected to room one. To the right from the veranda a door takes you into the other part of the house. Here is one large room, 5m x 6m, there is also a small 6 sqm room which would be good for a shower/toilet for this side of the house. There is also space for a built-in wardrobe. Also on this side of the house is the basement, which is a sizeable 5m x 4m. Outside steps lead to two other rooms, 6m x 5m and 5m x 5m. However, this part is not completed yet. The structure of the house is good and solid; the roof is in excellent condition. The garden is 1200 sqm in size with lots of fruit trees. At the bottom of the garden is a large outbuilding. The electric and water are connected, cable TV and telephone line is just outside the plot. Access is all-year-round by asphalt road. This property could easily be divided into three seperate dwellings - one for the owners and two to rent out to tourists.